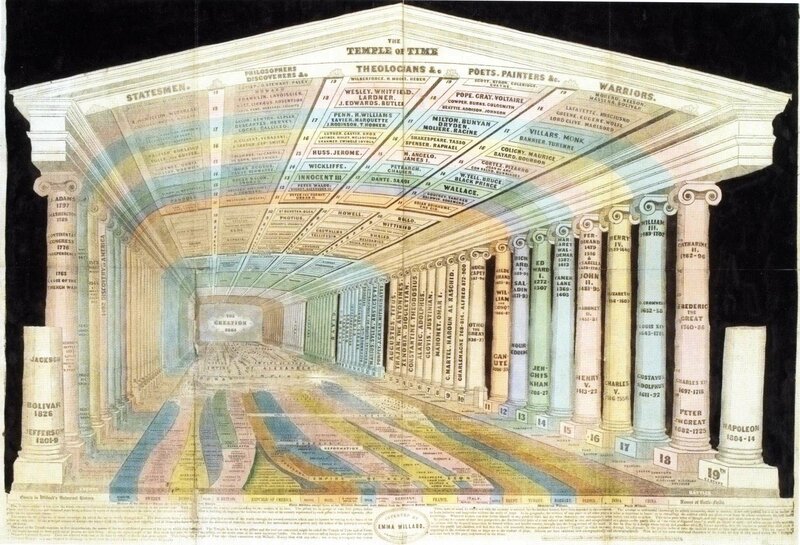 In the memory forum, Cole linked to a fascinating illustration of a memory palace for memorizing historical dates. The “Temple of Time” is a three-dimensional projection of historical chronography. In the temple, the vertical columns represent centuries, with those on the right showing names of important figures from the Old World while those on the left show figures from the New World. The floor shows a historical stream chart. The ceiling functions as a chart of biography. 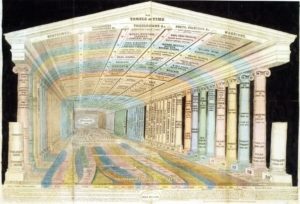 The “Temple of Time,” created in 1846 by the pioneering American girls’ educator Emma Willard, draws on the tradition of Renaissance “memory theaters,” mnemonic devices that allowed people to memorize information by imagining it as architectural details in a three-dimensional mental space. The blog post says that the illustration was found in the book, Cartographies of Time (paperback) by Daniel Rosenberg and Anthony Grafton. If anyone buys the book, please post a review! UPDATE: my first experiment with this memory palace idea is posted here. That’s a cool image and might provide a good starting point for organizing historical information, but I would definitely use a journey of my own. I’ve never liked artificial memory palaces as it seems too easy to confuse rooms, pillars, etc. I do like the idea of organizing areas by theme, similar to the “town technique” that some use for foreign languages (verbs in one part of town, nouns in another, etc.). I had a bad case of insomnia last night and was up till 8:30am. During that time, I came up with some ideas about the memory palace, which I will try to post by tomorrow. The idea of using a town for historic dates is intriguing. This is fascinating. I have been toying with the idea of using a town to memorize historical facts for the memory competition but in the end, I had to discard it and go for a simple link method to memorize the date and fact. I posted some more ideas about the memory palace here. Hi Josh; Look at Prof. Strass’ (University of Eurfurt in Germany) RIVERS of TIME first published in German in the early 1800’s but translated into English, French and Russian. The English version went through 14 printings. It is a large library wall chart. The Library of Congress (LOC) has a copy (I also have a copy). Strangly, the last time I looked that the LOC copy, it was indexed as “Vriki Remini” (spelling?) which was the English transliteration of the title of the Russian version meaning “Rivers of Time”. This chart goes back to the beginning of Human History. The URL for Cartographies of Time 404s. I found Cartographies of Time online at Amazon. The universal opinion is that, as great as most of the text is, too many of the charts are unreadable because of the small print and fuzzy reproductions. I await another edition that corrects these problems, for this is a book I would dearly love to have. Thanks for letting me know. I’ve updated the broken link.